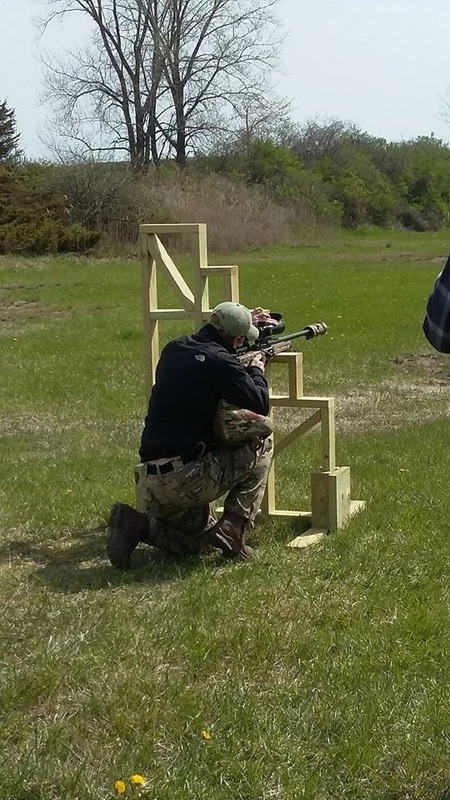 The May 7th Wisconsin Precision Rifle Steel Challenge was my first match of the 2016 season. I had planned on using this match as a warm up to gauge my abilities and highlight practice needs for the upcoming the South Dakota Precision Rifle Match. The WPRSC is held at the Racine County Line Range which is a private club just south of Milwaukee. This is the first year that the club has allowed these types of matches and for that I would like to thank them for their hospitality. Our day started out at 0500 with around a two hour drive to the range. The weather started out chilly and windy but the rain held off for the entire day, which Amy and I were thankful for. The range is set up similar to most other 600 yard “high power” type ranges, with berms running along both sides and the down range end. This presents interesting challenges for the match director with stage set ups. The range is well kept and is an excellent facility from what I could observe. John, the match director, did an excellent job of setting up the stages so that they were both challenging and fun despite being confined by the range dimensions. Not to mention the overall layout of the stages helped keep the match moving along safely and efficiently. The wind was a major factor in the difficulty of the stages this day. The wind would play havoc with shooters all day. With the wind at variable speeds between 5mph and 25mph. It definitely beat me up before I made my adjustments. The first stage was a “Know Your Limits” or KYL rack at 300 yards. I felt pretty confident jumping right into a KYL rack but I was soon humbled. I totally blew my wind call and whiffed my first shot off the right edge. Not a good start to the day. All but one shooter in my squad scored a zero on the stage. Stage 2 was a seated positional shooting stage set at 300 yards. Shooting from a seated position was a known weakness for me. That weakness reared it’s ugly head during this match. Keep an AI rifle with a suppressor hanging off the end of it was far more difficult than anticipated. Once again I whiffed on this stage and scored a zero. My confidence going into Stage 3, “Tires of Pain”, had taken a pretty good hit at this point. I was starting to get a little worried that all of practice had been for nothing. Tires of pain consisted of 5 tires orientated in such a way that the shooter would have to shoot either through the tire or off the top of the tire. To make the stage more challenging the shooter was forced to take two shots through the opening of the tire at a 12” square from 400 yards. Once the second shot was fired, the shooter then had to transition to the next tire and fire two more shots from the top of the tire at a 66% IPSC target positioned at 400 yards. The shooter repeated this a total of five times for a total of 10 shots. I was finally able to get on the scoreboard with five points. I had some issues with accidentally ejecting my magazine while positioning the rifle for the lower tire shots. I also discovered the benefits of using a pump pillow or large bag. One of the other shooters on the line was generous enough to allow us to use his and I immediately decided I was going to nab one as soon as I got home, in hopes of it arriving in time for the South Dakota match. Stage 4 was also positioned at 400 yards and consisted of firing four shots from any two positions on the barricade then transitioning to prone for two shots followed by four more shots from any two positions on another barricade. Once again the large bag came in handy and I was able to squeeze out six points. For whatever reason, the wind didn’t play as big of a roll on this stage as it had on the earlier stages. I’m not sure if there were just enough trees blocking it at the firing position or if it had died down a bit. My confidence was starting to come around and I was starting to feel pretty good going forward. Stage 5 was the “roof top” stage, a staple of “PRS” type matches. The shooter was to start from a standing position. Upon the command to engage, the shooter was to advance to the roof and fire five shots, after five shots they were to transition to a prone position next to the roof prop and fire five more shots. Again the the large bag came up huge for the roof prop. I decided to try laying on my side rather than using the “frog” technique. I felt that I could get a more stable position from my side than attempting to be Frogger. I managed six more points on Stage 5. Next up was Stage 6, another 500 yard stage, consisting of one shot from your strong side, step or jumping over a low barrier and firing one shot off of your support side. The shooter would alternate for a total of ten shots. If I could shoot this stage again I would have used two rear bags, one on each side. As it was, I ended up forgoing the rear bag on my support side shots to try to save time. Also getting in and out of your firing position in as quickly as possible. As one shooter put it, you’d best be doing “burpees” into and out of your position. In the end I managed a score of five on this stage. My confidence was building quickly by this point and I was actually looking forward to the last two stages. Stage 7 was by far my favorite stage. It was was a “no dial” stage set at 600 yards. I was a bit nervous about not being able to dial since I don’t have one of the fancy “christmas tree” reticles that are so popular but it turned out pretty good. I held just over .5 mils of windage, basically bracketing the target with the hash marks in my Nightforce Mil-R reticle. I managed to score a nine point stage, my best of the day. One thing I did learn was that a “christmas tree” reticle like the Horus H59 would be extremely helpful. Fortunately I was able to take car of that little problem after the next SDSC on May 14-15. I’ll cover that in a different AAR. Stage 8 was titled “Russian Dolls” aka Test Your Limits. I managed to score a measly two points on this stage which was immensely frustrating after the previous stage. For whatever reason I just could not get past the second plate. All in all I had a really good time at this match. It is limited by the fact that it is on a square range but here in Wisconsin we are pretty limited in our opportunities to shoot long range. The best part about the match is that it forces to me to slow down and focus on fundamentals while allowing me to work out kinks in my game. Lastly I’d like to thank Rock Creek barrels for sponsoring the match, Racine County Line Club and most importantly the RO’s; without them the match could not happen.